At a public travel fair in Copenhagen, Denmark the “Tourism Sustainability” booth was like a deserted island. The two lone sustainability advisers in the booth were killing time inventing games and sharing stories like Crusoe and Friday. The travel fair was packed, but visitors were avoiding the tourism sustainability booth like a bad conscience, and instead diverting their attention to the exotic travel offers from travel agencies and destination organizations. Crusoe and Friday decided to venture off their deserted island booth and impose themselves on the travel fair visitors instead. The response they got? So it turned out that people actually find tourism incompatible with sustainability. The tourism sustainability booth was considered misplaced among the inviting holiday dreams served by the travel and tourism trade. The good news, these fair visitors are obviously aware that traveling on flights and cruises have negative impacts on the environment. The bad news, people somehow seem to assume that the battle is lost once you include an airplane in your holiday, and that there is no point in trying to fight a lost cause. There are a couple of wrong assumptions in the two responses above. Tourism sustainability is not merely about pollution from your airplane and other means of transportation. In tourism we refer to three aspects of sustainability, and each of these should be taken into consideration: 1) Environmental, 2) Social, and 3) Economic sustainability. Environmental sustainability includes protection of wildlife, natural habitat, water and energy resources, and waste management, both in a global and local perspective. Social sustainability in tourism refers to mutual respect between hosts and guests, and fair involvement of the local population in the benefits of tourism and in the central decisions in tourism development. Economic sustainability is both sustaining a profitable tourism business while offering a fair distribution of the economic benefits and jobs generated by the industry. 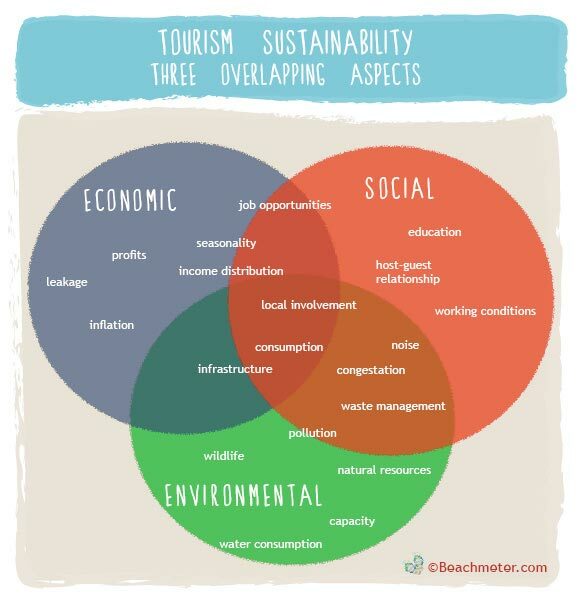 The three aspects of tourism sustainability are highly inter-related. Thus, a travel holiday is so much more than the transporting flight – hopefully. There are the natural surroundings and wildlife of your destination, the local population, culture, economy, the accommodation, the food, the shopping, and the excursions. In all of these aspects there are choices to be made that can be more or less harmful or beneficial to the travel destination from a sustainability point of view. Many of these choices are no different than choices you make every day at home, but in fragile natural environments and low-resource settings these choices most often have bigger implications. In the vast majority of cases, transportation in travel has a negative environmental impact. But does that mean that we might as well discard all other measures of sustainability now that we can’t reach perfection? It would be like saying that because you can’t stop eating cookies, you might as well also drink coke, eat hot-dogs, avoid all forms of exercise, and start smoking. That doesn’t make sense. So instead of thinking sustainability is an “either/or”-question, we should consider sustainability a complex continuum ranging from sustainable to non-sustainable practices and outcomes. Our choices before, during, and after our holiday have an effect on people, economies, natural surroundings, and the environment. And small drops of sustainability is better than none at all, so sustainability and tourism is not a contradiction. They are highly integrated and inter-dependent. In fact, we need to “think and act” tourism sustainability in order to maintain our beautiful travel destinations for generations to come. Tourism Sustainability will be a recurring theme so be sure to check regularly for updates on the subject on beachmeter.com.